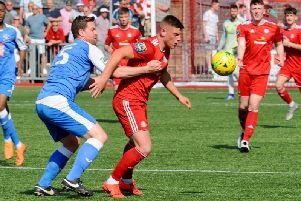 Aston Villa defender Tommy Elphick says he is buzzing to be named an ambassador of Worthing Football Club’s Development Centre. Rebels chairman George Dowell set up the centre last year but is ramping it up to the next level for the coming season. The centre is open to anyone aged from under-seven to under-16 who wants extra training sessions each week. The centre is being run by Rebels head of football development Jon Meeney, who is also joint manager of the first team with Tommy’s brother, Gary. Worthing held a taster session this afternoon and a large number of children turned out in heavy rain, with Tommy also on hand to watch proceedings. Tommy joined Aston Villa from Bournemouth this week, having started his career at Brighton & Hove Albion. On being involved with the Development Centre at Worthing, said: “I’m buzzing to be involved here. “When my representatives and I were asked about doing something here, it was something that we couldn’t really resist as we’d done it before in London. “To see so many people come out today in not so good weather is a really encouraging start and bodes well for the future with the academy and local kids improving as footballers. “Doing something like this has a huge incentive for me is I don’t see enough parks and enough facilities like this being used and kids getting out and playing football anymore. Tommy admitted he was delighted to see Rebels clinch promotion into the Ryman League Premier Division last season. He said: “Obviously I’m immensely proud of what my brother and Jon achieved here. “I kept my eye on things during the season and it just really improved week on week. The commitment that George has made is a real heart-warming story and something that should never ever be over looked. “To get this club back to where it is makes for really exciting times, with two young managers, a young chairman and young players who play the right way and hopefully they can keep progressing. Looking ahead to Rebels’ upcoming season, Tommy said: “I think they’ve made some really astute signings with Sam Rents, who’s someone I played with in the first team at Brighton, and Kane Wills, who was an apprentice at the time as well. Tommy admits managing is something he would like to get involved with in the future after seeing the success Gary has had but he is focused purely on his new challenge ahead at Aston Villa: “I’ve still got my best years ahead of me, so I’ve got to concentrate on that and have got a new challenge ahead with a new club so, first and foremost, I’m looking to get another promotion and progress my career as far as possible.